LADY ZEP is Melissa Jane, lead vocals; Marija, lead guitar; Miiko, bass guitar; and Leanne, drums. Saturday, February 23rd, we are hosting ROCK GODDESSES UNITE, an all-female tribute band concert benefiting the Center for Assault Treatment Services (CATS). Headlining the concert is LADY ZEP, a fantastic band of veteran performers who have come together to pay homage to the great music of Led Zeppelin. We caught up with Lady Zep during a recent rehearsal and the band graciously answered a few of our burning questions. SB: How did Lady Zep get started? Melissa (vox): We had all worked together on other projects. We really love performing together and we all love playing Led Zeppelin songs so we decided to start our own Led Zeppelin tribute band and call it Lady Zep. Leanne (drums): We had played together before and I really enjoyed the experience of playing with these musicians. We’re all huge fans of Led Zeppelin; that’s what brought us together. There is so much great material that they have written. SB: Who’s the biggest Led Zep fan of you all? Marija (guitar): I think it’s a 4-way tie! SB: Do you see yourselves in Lady Zep 5 years from now? Marija (guitar): Definitely! We should just about know the whole catalog by then. Melissa (vox): Absolutely! I will never get tired of performing Led Zeppelin music, it is a true passion. Leanne (drums): I definitely see us still playing in five years. There is so much we want to do. SB: What’s the coolest fan experience you’ve had? Marija (guitar): When, after I’ve watched my guitar neck for a while, I looked up to find that the house is packed. It feels like a huge family reunion. Playing the music they love is my way of giving each Led Zeppelin and Lady Zep fan a big hug. Melissa (vox): Meeting my boyfriend, who is a huge Led Zeppelin fan! Leanne (drums): I enjoy sharing the live experience of playing and hearing Led Zeppelin’s music with others. It feels good when I’m having fun, the band is having fun, and the fans are having fun. SB: How did you go about learning Zeppelin songs? Marija (guitar): We get the music from various sources, then evaluate and piece it together. Then we practice as though the original members of Led Zep were coming to our next show! SB: How far do you go to re-capture the original Led Zeppelin sound? Similar equipment, techniques, set-up? Marija (guitar): We always work toward getting as close to the original sound as possible. We have some similar gear and want to, eventually, have the same gear they used, or as close as possible. Leanne (drums): I listen a lot to each song that we’re working on. I like listening to different versions of their songs. Especially live versions, because they play them differently than the studio versions. This way we can pick up on ways they approached each song. SB: What are the most difficult songs in the catalog to play? Marija (guitar): The songs with the most guitar overdubs. Also selecting the most prominent parts and combining them in a way that sounds the most natural and authentic. Melissa (vox): All the songs have challenges. You just have to knuckle down and dissect the songs into parts and listen and practice over and over again until it finally sticks. SB: What songs are part of every show? Marija (guitar): Some include “Immigrant Song”, “Whole Lotta Love” & “Rock & Roll”. SB: What’s the greatest obstacle you’ve had to overcome in being Lady Zep? Marija (guitar): Really, nothing! Regarding other bands and, specifically, female bands: Love for the music we play brings us together. When lady musicians support each other, everybody wins. Melissa (vox): People have tried to exploit the band or take us for a ride. We have to be very tough on the business side of it so we can continue being able to sustain a living being in Lady Zep. SB: Does anyone play in another band? Melissa (vox): I perform in two original bands, SYNN is my metal band and Final Gravity is my Progressive rock band. Leanne (drums): I play in a couple other projects in addition to Lady Zep. I am in an all female tribute to Alice in Chains, called Allison Chains [Editor’s Note: Allison Chains is ALSO playing at our ShockBoxTV Benefit Concert!]. I also play in a funk band called Tokyo Saucer. SB: Since Zeppelin frequently departed from the album versions of their songs in their live sets, do you also allow yourself the flexibility to stray from the original arrangements in live performance? Miiko (bass): Yes, we’re really not interested in being a human juke box. We want to pay homage to the style and craft of all the elements of Zep, but they had their roots in blues and to me, that says that every night is different. We have special set arrangements of some tunes that are really cool and fun, some tunes we “wing it” or will jam into the next tune. Depends on the crowd, the night and the vibe. Sometimes the band is on fire and we extend solos—who knows what will happen next? Leanne (drums): We do allow some flexibility in our arrangements; mostly we’ll add things that we like from live versions that they played. We jam on some sections of songs that allow it, and in that way, our soloing colors the song in our own way. On some songs I’ll play guitar, which is something Bonham never did, but it sounds great to have another guitar on acoustic songs to cover the multiple guitar tracks that Page added in the studio. SB: Have you ever seen anyone from the original Led Zep in performance? Has any of the surviving members had the opportunity to see you play? Miiko (bass): I saw [Led Zep bassist] John Paul Jones when he played Nokia with the Crooked Vultures. We had a nice meet n’ greet after. Really nice guy. Sooooo talented! 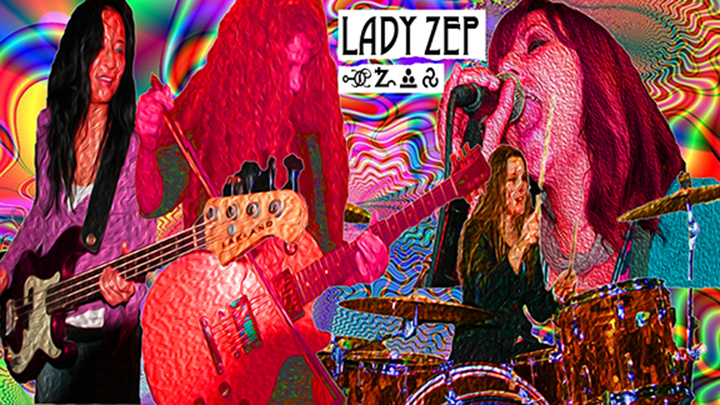 Keep tabs on Lady Zep via their Website and Facebook. Drop us a note at ShockBoxTV@Gmail.com with any band/song/album suggestions. These girls are awesome,They rock the house every time and the fans really get into it.Its Happy music.